The wait is almost over. The fellas leave no rocks unturned in cautiously predicting the 2017-18 season for the Eagles and the Patriot League and dissecting the biggest storylines. 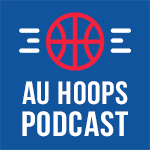 Here's your primer for a new season of AU hoops.